It's brown, black and white. It's got two black eyes. It's got whiskers and a long tail. And it's got four tiny legs. It's very nice. I love him! Have you got a pet too? Can you describe it for me? Hello Ariadna! I know! Your rabbits is called Bolita!! My favourite animal is the cat! I love them and I have got one! Its name is Mordor!! Thank you and see you in class!!! i'm Rafa Álvarez. 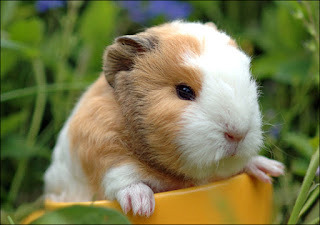 I have a Guinea Pig, her name is "Bigotes". I have four chickens, too. They put on eggs. Rafa what a nice surprise!! Really? have you got four chickens?? Fantastic! I have also a cat called Modor. It's big and black and a Little bit fat! ;) but I love him!